Back in 2012, I saw "Snow White and the Huntsman" and it was fine. Not horrible, not fantastic, just fine. I think out of the two Snow White movies we got that year, it was the better of the two, but I just feel that is a fainter praise than it probably comes off. I certainly would have never guessed in a thousand years that it would ever get a sequel. But sure enough, in 2016, we get "The Huntsman: Winter's War." Which is a prequel/sequel that focuses on how Chris Hemsworth's Eric became the Huntsman we saw in 2012. We also see a bit of history of Raveena, the evil queen played by Charlize Theron and her sister Feya (Emily Blunt). Who gained the power to freeze things once she got angry by her husbands betrayal. Did we need this sequel? Not even close. Did we ask for this sequel? I don't know about your friends and family, but I know nobody who was hoping and praying for a return to this world of Snow White. So I ask myself why this movie was even made. All I can guess is that its just another hollow reaction to the success of Disney's "Frozen" from 2013. Because Emily Blunt's Feya takes center stage in this movie. If you can imagine a warped version of Elsa who gained a hunger for power and took children out of their beds to build an army, First Order style. Feya forbade this army to fall in love, because after her husbands betrayal, love is bad. Two people she trained her army were Eric and Sara (Jessica Chastain). Eric and Sara ended up falling in love, so one day Feya had Sara killed in front of Eric's face, before exiling him from her army. But don't worry, I haven't spoiled the movie. You see, Sara didn't really die. Feya just used her powers to have Eric believe she died. Turns out, Sara is looking for the mirror that brought Raveena so much power, because she knows Feya wants it. If the mirror ends up in Feya's hands, it could mean big trouble for the entire realm. At this point, the movie becomes a typical, flat, Liam Neeson-narrated "adventure." The mirror is turned into the McGuffin of the movie, and by the end we don't know if the true villain is Feya or Raveena. Eric and Sara spend some time of the movie getting mad at each other, but of course, they fall in love again. What is really confusing is that they keep making a big deal about saving Snow White's land, even though we never really see Snow White at all in the movie. I love Chris Hemsworth, but I have to admit that it feels like he's incapable of making any good movies that aren't under the Marvel banner. (Aside from "Rush") He's packed full of charisma and tries hard to make this movie count, but nothing about his character stands out. The script he trying to bring to life is horrid, and he just can't make any of it count. Should I only get excited about Hemsworth when he's playing a character named Thor? That certainly seems to be my take on his career at large. Charlize Theron is fine I guess. She isn't in the movie much. This isn't the movie we think it is from the marketing. While I'd welcome something like that normally, this is such a big mess that I don't think there is a movie at all. I think Emily Blunt is fantastic, and I think she does everything she was asked to do here, there is just nothing of substance to her character. The same can be said of Jessica Chastain's character. There is nothing these characters offer that would want me to buy a ticket to another adventure, there is nothing here that can possibly make me care about anything I am seeing. Any actress could have done what Raveena, Feya and Sara do here, and I am a little disappointed that Theron, Chastain and Blunt didn't do much make these characters stick out. These are three of the best actresses working in Hollywood right now, and they made this movie feel like a Syfy movie. 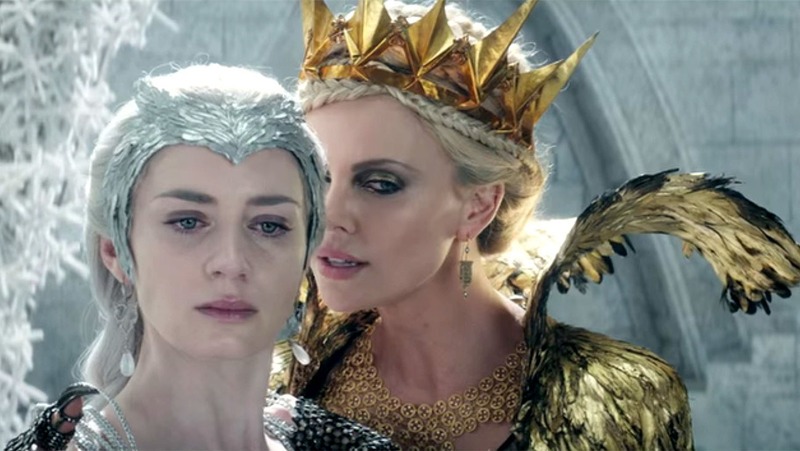 When it boils down to it, "The Huntsman:Winter's War," is a grab-bag of events. First, its about Eric and Sara and their quest against Feya. Then I guess they didn't know how to end it, so they threw Raveena in for a big main event-style fight to close things out. Everything that had to do with the mirror just shows that this movie is about how incredibly insecure Raveena and Feya are. I wonder, do women find this sexist? Was this the fable that the Grimm brothers were aiming for so many years ago? I don't know, I just know everything in this movie was poorly explored, poorly explained, and felt hollow. Plus, Feya rides into battle on top of a polar bear. Much like the White Witch from "Chronicles of Narnia." I literally thought I was watching "Chronicles of Narnia." Couldn't the filmmakers been a little more original?